PILSEN — When some artists she knew started making earrings with bird feathers, Lisandra Martinez knew she wanted to jump on the bandwagon and make some of her own. There was just one problem: She was vegan, and didn't want to use anything that came from animals. But while bike shopping with a friend last summer, she came across a bucket of punctured bike tire inner tubes sitting in Irv’s Bike Shop at 1725 S. Racine Ave.
And, because inner tubes are notoriously difficult to recycle in Chicago, Martinez was handed a free bag of the stuff. Soon, with a few alterations, those rubber tires became "feather" earrings. “It’s a little more limited because it’s all black rubber, but I just really try to think outside the box with what I can do,” she said. Now, several Pilsen bike shops supply her with the tubes on a regular basis. It’s hard to miss Martinez, 32, on the street. A tall Puerto Rican with hair that explodes in curls, Martinez can be seen around Pilsen wearing a large red smile and a rubber bow tie. The bowtie, along with feather earrings, flower necklaces, and hairbows, is a part of her jewelry line, Fixed Ear. The name is a play on fixed gear, the type of bicycle that Martinez rides. 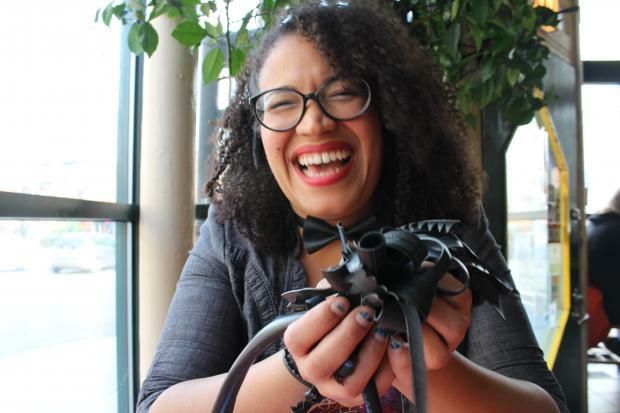 Most recently, her work, which range in price from $5 to $30, was featured in a Day of the Dead show at The Elephant Room gallery at 704 S. Wabash Ave.
She finds time to make rubber feathers in between taking care of her 6-year-old son Onix and running her own vegan catering company, Heart’s Desire Vegan. But it wasn’t always rubber feathers and vegan tacos. Martinez was born in Puerto Rico and lived in Logan Square before her family later moved to Elgin. She earned a bachelor's degree in international studies from George Washington University in Washington D.C. before going to law school at the University of Illinois at Urbana-Champaign. But she decided not to take the bar, and in 2010, after coaxing from friends, Martinez left Elgin and moved to Chicago to join Pilsen’s artist community. “I’ve always been artistic, but it’s just the opportunities that are available here [in Pilsen]. You start to really grow as a person and an artist,” Martinez said. At Working Bikes Cooperative — one of Martinez’s rubber suppliers — manager Paul Fitzgerald said he originally knew Martinez by her DJ name, La Perla. “For a while there, every event I went to, she was either playing the music or serving the food or both,” Fitzgerald said. Working Bikes, a nonprofit at 2434 S. Western Ave. that donates bike both locally and internationally, has volunteer days where bikes are fixed and packed for overseas shipping. And lately, those volunteers are enjoying carne asada vegan tacos made by Martinez. “So far everybody loves her food. We haven’t had any leftovers to speak of,” Fitzgerald said. Working Bikes has a display of Martinez’s rubber jewelry for sale. But you can also find her stuff by going to fixedear.com or heading over to Pilsen Vintage and Thrift at 1430 W. 18th St.
Next, Martinez said she is working on a rubber fanny pack, for hands-free rubber style.